All Oceanside homes currently listed for sale in Oceanside as of 04/19/2019 are shown below. You can change the search criteria at any time by pressing the 'Change Search' button below. "Ocean Front Location! Location! Discover this Architecturally Grand 7 Bedroom 8 Bath Oceanfront Estate! Rare, Custom Modern Home, is so versatile it can handle it all!! Family Home, Vacation Getaway, Corporate Retreat Rental or Vacation Rental!! 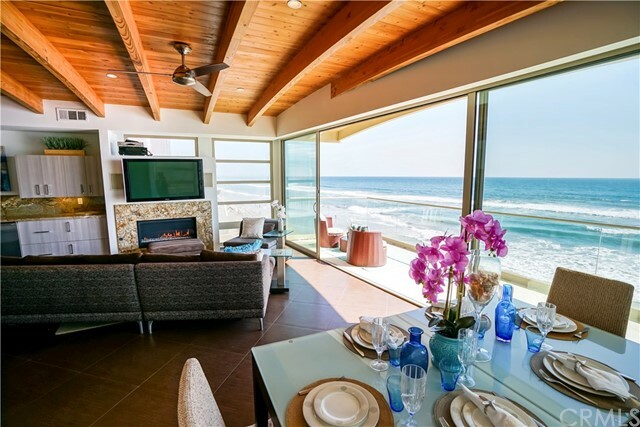 Stunning Ocean Views on every Level! Those Accustomed to the Finest will Appreciate the Exceptional finishes throughout this Luxury Estate. An elevator accessing multiple levels is at your service. 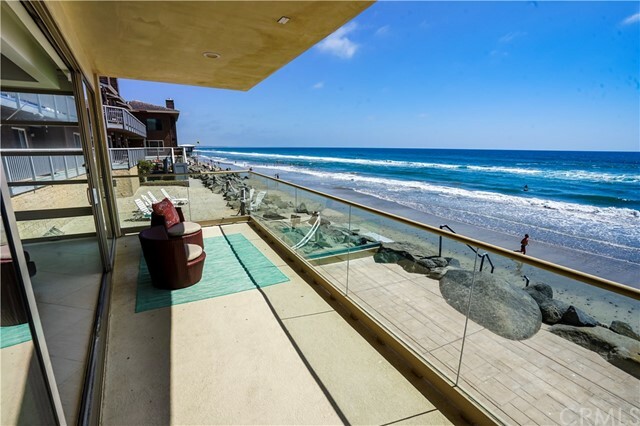 Definitely a place to live and indulge your Beachfront Lifestyle Neighborhoods: Beach Equipment: Range/Oven Other Fees: 0 Sewer: Sewer Connected Topography: LL,"
"Beautiful and luxurious beach front home with panoramic views from Dana Point to La Jolla. This incredible home features 4 bedrooms, 4 full baths & a powder room; 3,526 well appointed square feet of ocean front luxury living. Let s start with the reason to own this perfect home, The Beach! Adjacent to the lower level bonus room, is a multi-tiered patio which offers a perfect lounging area, a built in BBQ, an outdoor shower, plus a sand filled retreat that is directly adjacent to the beach, with steps leading down to the sand. What could be more perfect than that! The lower level has a spacious great room with a wet bar, a laundry room, a dishwasher, wine refrigerator, fireplace, & bedroom with ensuite. The main floor has a gourmet kitchen with top of the line appliances which include a Sub Zero refrigerator, Thermador oven, Wolf 6 burner cooktop, Bosch dishwasher, wine refrigerator, pot filler, & walk-in pantry. The main floor also includes a large dining area with views of the ocean. The third floor offers a magnificent master bedroom with endless ocean views plus an amazing ensuit, a second laundry room, access to the rooftop deck, & another bedroom with ocean views. At the end of a long day, start the fireplace, relax in your very own steam shower, then take a soak in the whirlpool tub; all while listening to the crashing waves of the ocean & watching the surfers. What could be better than that? DON'T MISS OUT ON THIS AMAZING OPPORTUNITY. Call today for a private showing." "Magnificent oceanfront home boasts approx. 4300 square feet of well appointed living area with absolutely breathtaking views. Unique architecture frames the blue pacific and you feel as though you are on the water from the great room-gourmet kitchen-dining combo. Entertain family & friends on the large oceanfront patio or enjoy a game of pool or a movie in large downstairs bonus-game room. Master suite with sumptuous beautiful bath and a walk in closet that is the length home with custom shelves. Neighborhoods: The Beach Equipment: Dryer,Fire Sprinklers,Garage Door Opener Other Fees: 0 Sewer: Sewer Connected, Public Sewer Topography: LL,"
"Oceanfront dream condo, custom built with walls of glass and views of crashing waves and beach access, sunswept beaches and stunning sunsets. Located in The Strand area of Oceanside this is private beachfront with no public walk way. Elevator gets you to the roof top deck from the garage or you can take the stairs. REMODELED recently; 4 bedrooms each with ensuite baths + powder room and an additional 3/4 bath in garage. GOURMET kitchen with granite counters, stainless appliances, subzero refrigerator/freezer+ wine fridge & ice maker. 5 Burner gas range, double ovens, micro & Meile coffee maker. Breakfast bar & 2nd bar in large GREAT room with fire & ice fireplace and walls of glass out to balcony overlooking the blue pacific. Built in BBQ. Open beam ceiling, Casa blanca style fans, recessed lights Strategically located in the Strand area of Oceanside, this is truly a great value. Porcelain tile floors, designer carpet. mirror wardrobes. Dual pane doors and windows. 4 Fireplaces"
"GORGEOUS LUXURY ON 100 OF OCEANFRONT ENJOY BREATHTAKING OCEAN VIEWS AND REFRESHING OCEAN BREEZES FROM ALMOST EVERY ROOM IN THIS AMAZING VILLA. 45 FEET OF WINDOWS ON THE WATER! FEATURES INCLUDE: LIGHT & BRIGHT OPEN FLOORPLAN, DESIGNER FINISHES, LARGE BALCONY W/UNINTERRUPTED WHITEWATER VIEWS, GOURMET KITCHEN W/STAINLESS STEEL APPLIANCES, 2 MASTER SUITES, SPACIOUS LIVING ROOM W/PANORAMIC OCEAN VIEWS, PRIME LOCATION WALKING DISTANCE TO LOCAL RESTAURANTS & SHOPS. GREAT TO USE AS A VACATION RENTAL. Neighborhoods: The Beach Equipment: Range/Oven Other Fees: 0 Sewer: Public Sewer Topography: LL"
"Beachfront home that lives like a detached. Private and spacious beach front patio, high ceilings, ocean views from kitchen, dining room, living room and master bedroom. Two car garage, private laundry room. Very popular vacation rental! Two bedrooms plus a den/3rd bedroom. Large open kitchen with breakfast bar and stainless steel appliances. Fireplaces in living room and master. Master suite has soaking tub, walk in shower and two walk in closets. Neighborhoods: The Beach Equipment: Garage Door Opener, Range/Oven Other Fees: 0 Sewer: Sewer Connected Topography: LL"
"OCEANFRONT DREAM CONDO. Custom built with walls of glass out to crashing waves from beachfront balcony. Only 2 condos. This is well located in the Strand section of Oceanside with NO public walkway. 3 Bedrooms each with ensuite baths + powder room, & 3/4 bath in garage for after beach activities. GOURMET kitchen with stainless appliances which include Subzero refrigerator/freezer, micro, 5 burner gas range, double ovens. Granite counters including a bar with wine fridge & ice maker. GREAT room has walls of glass open to balcony patio with glass surround and built in BBQ. Recess lights, tile floors & designer carpet. Security cameras and alarm system. 2+ car garage. Laundry room & 2nd set of laundry hookups in garage. Dual pane doors and windows"
"Located right on The Strand, this fantastic oceanfront home offers the best of luxury living in the heart of Oceanside. The beautiful, gourmet kitchen flows into the expansive floor plan, opening to the balcony with double sliding doors. Your private elevator leads to secure underground parking for two and an additional 160 square feet of storage. Walk to the historic Wooden Pier, The Coaster or Oceanside's Harbor Village. You won't want to miss this special home! Neighborhoods: Beach Equipment: Range/Oven Other Fees: 0 Sewer: Sewer Connected Topography: LL"
"Gorgeous Coastal Home with ocean view rooftop deck! Spacious units perfect vacation rental or primary residence. Private two car garage. This beautiful private house is located across the street from the beach. You have the views, sounds and breeze from the Pacific Ocean. Walk across the street to the beach where you can surf, swim, jog, or walk down the largest wooden pier on the west coast. You can fish and dine on the pier. See supp Neighborhoods: The Beach Equipment: Garage Door Opener Other Fees: 0 Sewer: Sewer Connected Topography: LL"
"All you need are the keys for this furnished spectacular Oceanfront home boasting Breathtaking Views. Great Room w/ Floor to Ceiling Windows, FP & Balcony opens to the Dining Room & Kitchen, perfect for entertaining. Spacious Master has large Shower, and walk-in closet. 2nd Bedroom has Full Bath, that is also accessible for Guests. 3rd bedroom & bath opens to the sand. Direct access private 2 car garage. Complex features a Community Rm w/ Kitchen, Full Bath, a Spa Tub, Steam Room & Private Beach & Patio. Neighborhoods: Oceanside Equipment: Dryer,Garage Door Opener, Vacuum/Central, Washer Other Fees: 0 Sewer: Public Sewer Topography: LL"
"NEW CONSTRUCTION - CLOSEOUT! Last luxury Oceanview residence available with $30K+ in Builder incentives. Pacific Sands is a brand new boutique luxury community located a few steps from the sandy beach with dramatic white-water Ocean views from lanais and private roof-top deck. 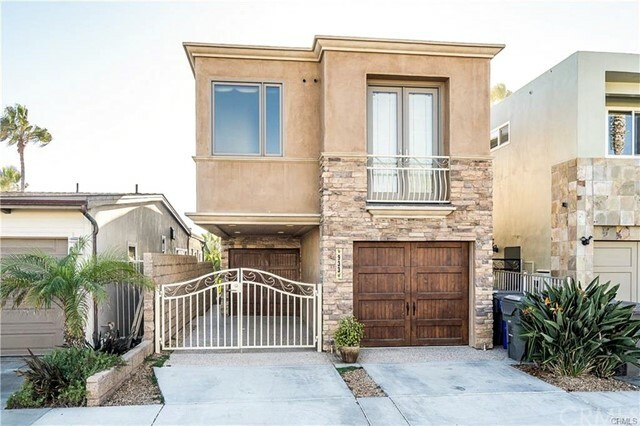 This lavishly appointed two-story townhome boasts open floor plan, contemporary design and high-grade custom finishes. Sq. Ft doesn't include the private roof-top deck w/built-in BBQ. Elevator to the residence and roof-top deck. Neighborhoods: Oceanside Equipment: Fire Sprinklers,Garage Door Opener, Range/Oven Other Fees: 0 Sewer: Sewer Connected Topography: LL"
"700 South Strand premier ocean front address! Ocean front luxury condominium with breathtaking panoramic views from entire living area! Spacious master ensuite that opens into private deck. Gorgeous kitchen with stainless steel appliances, modern cabinetry, island seating and tile backsplash. Gated patio that gives you direct access to the Strand. This is truly coastal living at its finest! Conveniently located near shops, restaurants, and the pier harbor and train station. Neighborhoods: Ocean Front Equipment: Garage Door Opener, Range/Oven Other Fees: 0 Sewer: Sewer Connected Topography: LL"
"STUNNING 180 DEGREE OCEAN AND BOARDWALK VIEWS FROM THIS CHARMING AND BEAUTIFUL PENTHOUSE. THIS COTTAGE STYLE HOME FEATURES 26 FEET OF GLASS FROM LIVING ROOM WITH ACCESS TO FULL LENGTH BALCONY.THE UPDATED KITCHEN HAS GRANITE COUNTERS AND MODERN APPLIANCES. EASY TO CARE FOR LAMINATE FLOORING THROUGHOUT. BEDROOMS HAVE SOME OCEAN VIEW FROM THE SIDE WINDOWS.THIS CONDO HAS A RARE OVERSIZE 2 CAR ATTACHED GARAGE ON THE MAIN LIVING LEVEL . THE BEAUTIFUL SEPARATE STUDIO MAKES A GREAT RENTAL OR IN LAW QUARTERS. Neighborhoods: Beach Front Equipment: Dryer Other Fees: 0 Sewer: Sewer Connected Topography: GSL,"
"700 South Strand premier ocean front address! Ocean front luxury condominium with breathtaking panoramic views from entire living area! Spacious master ensuite that opens into private deck. Gorgeous kitchen with stainless steel appliances, modern cabinetry, island seating and tile backsplash. Gated patio that gives you direct access to the Strand. This is truly coastal living at its finest! Conveniently located near shops, restaurants, and the pier harbor and train station. Neighborhoods: The Strand Equipment: Range/Oven Other Fees: 0 Sewer: Sewer Connected Topography: LL"
"THIS STUNNING OCEANFRONT LUXURY CONDO IS BEACH LIVING AT ITS BEST AND IS A MUST SEE! AMAZING BREATHTAKING PANORAMIC OCEAN VIEW FROM ALL LIVING AND DINING SPACES, AND MASTER BEDROOM. SPACIOUS PRIVATE PATIO OFF LIVING AREA AND MASTER SUITE. KITCHEN FEATURES GORGEOUS QUARTZ COUNTERTOPS, STAINLESS STEEL APPLIANCES, MODERN CABINETRY, ISLAND SEATING AND TILE BACKSPLASH. CONVENIENTLY LOCATED NEAR RESTAURANTS, SHOPS, ENJOY BEAUTIFUL SUNSETS, WALK THE ICONIC OCEANSIDE PIER, SHOP AND EAT AT OCEANSIDE HARBOR. Neighborhoods: THE STRAND Complex Features: , Equipment: Dryer, Washer Other Fees: 0 Sewer: Sewer Available, Sewer Connected, Public Sewer Topography: LL"
"ABSOLUTELY SPECTACULAR--the ULTIMATE in LUXURY BEACH LiVING! Top floor Kingston plan in the prestigious Montego condominiums this home is steps from the beach with gorgeous ocean and pier views from a Wall of windows. High-end everything-- from beautiful German Oak floors to Viking appliances. Smarthome electrical-- Enjoy sunsets on your own private balcony or entertain on the huge roof top deck with Big Screen, bar, barbecues. 3 parking spaces & big private secure storage in gated garage. Neighborhoods: Oceanside Beach/Pier Complex Features: , Equipment: Dryer,Garage Door Opener, Washer Other Fees: 0 Sewer: Sewer Connected, Public Sewer Topography: LL"
"OCEAN FRONT ON THE SAND, Watch sailboats, surfers, dolphins and whales from your living room. This Ocean Front Beauty Boasts an Ocean Views from Every room of the house. Surf check even from the shower! 1352 square feet 2br 2 ba Rare corner unit move in ready. Neighborhoods: Playa Real, South Oceanside Equipment: Garage Door Opener, Range/Oven Other Fees: 0 Sewer: Public Sewer Topography: GSL,"
"Stunning luxury residence at Crystal Sands offers spacious living, contemporary design & ocean views! 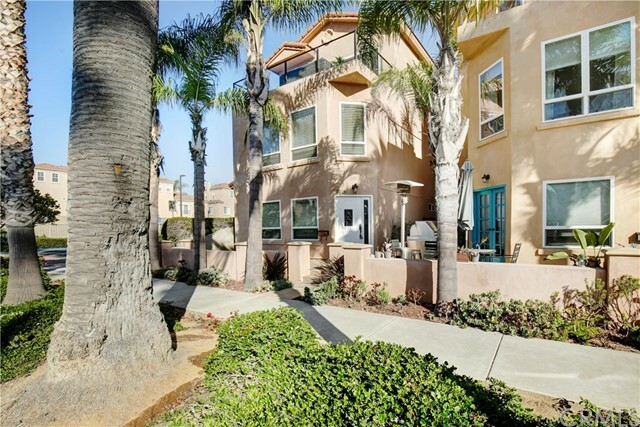 Located steps from the beach, this 2-level condo w/quality finishes is built to impress! Open floor plan features 10' ceilings w/skylights, Gourmet kitchen, hardwood floors, separate dining, living & master suite on main w/fireplace & 2 balconies w/private ocean views! Master boasts views, custom closet & lavish bath w/stone tile, dual vanity, walk-in shower & Jacuzzi. Luxury Living at the Beach! See SUPP Neighborhoods: oceanside Complex Features: , Equipment: Dryer,Garage Door Opener, Washer Other Fees: 0 Sewer: Sewer Connected Topography: LL"
"Timeless and prized Spanish architecture, meticulous attention to detail, huge ocean views from most rooms. An entertainer's paradise! The expansive living room flows into a large dining and lounge area connecting to a gourmet kitchen with bar and view terrace. Coastal at its best, a private oasis, low maintenance, completely fenced,lock and leave, walkable to shops, restaurants, wine and craft beer tasting options, the beach, strolling the pier and so much more! Neighborhoods: Seaside Equipment: Dryer, Washer Other Fees: 0 Sewer: Sewer Connected Topography: GSL"
"Former model home with extensively upgrade and decorated 5 bed 4.5 bath home with views above the golf course. Office with built-in desk and shelves & one bedroom with shower downstairs. 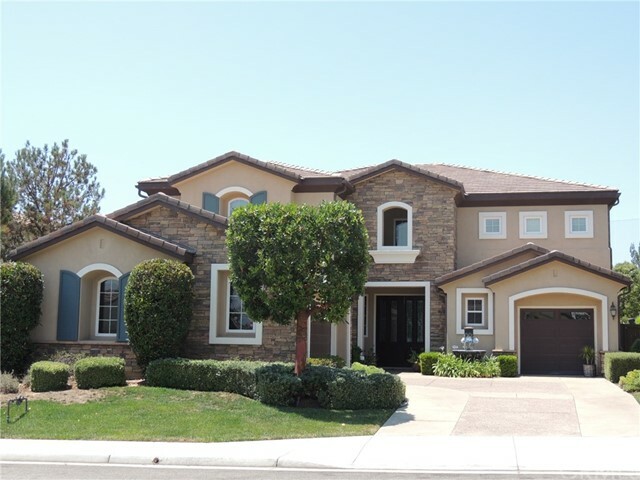 Custom double entry doors open to 2 story foyer with dual staircases and custom flooring. Crown moldings throughout the house. Master suite with large balcony with pool view. Commercial use stainless appliances including 6 burner gas stove, double oven, and custom 46 inch built in refrigerator. 3 sets of folding french doors in the living room, dining room, and master suite. Large bi-fold French doors in family room lead to the backyard. Family room features built-in entertainment system, cabinet and home theater speaker system. Association with Jr. Olympic sized swimming pool, picnic areas, walking trails. All furniture included except some personal items. Mello Roos taxes were paid off." "Back on the market! Buyer could not perform! Motivated seller, priced to sell! VACATION RENTALS ALLOWED! Spectacular 3 story beach community home with Ocean patio view located one block from the beach! Great 3BR/3BA detached home offers an elevator so you don't have to climb stairs, central AC, vacuum system, granite counter tops, custom cabinetry, pantry, gated garage entrance, walk-in closets, and jetted tub. CC&Rs allow vacation rentals! Nicely landscaped front and side yards and wired sound system." "Located in Morro Hills this private custom estate offers breath taking views to the ocean. Separate casita perfect for extended family or Airbnb investment. Home features polished travertine and granite throughout. Kitchen includes granite counter tops and island. Large master suite features wet bar, open shower, elevated tub, and granite counter tops. Open floor-plan with high ceilings, sweeping staircase, expansive balcony captures the eye. RV parking 2.51 acre lot for grove or horses. Neighborhoods: Morro Hills Equipment: Dryer,Garage Door Opener, Range/Oven, Washer, Water Filtration Other Fees: 0 Sewer: Septic Installed Topography: LL,GSL"
"Open and bright, enjoy the unique design of this home as it unfurls over nearly 2,500 square feet of beach home luxury. A magnificent, floor-to-cathedral-ceiling stone fireplace anchors the living room and stretches up to the large loft - a perfect area for a wet bar or third bedroom. The kitchen has been remodeled with recessed ceiling lighting and new countertops/cabinets. Whether through the peak ocean views inside or from the wonderful balcony water views, you'll never forget you're only across one... Neighborhoods: Downtown Oceanside Equipment: Dryer, Range/Oven, Washer Other Fees: 0 Sewer: Sewer Connected Topography: LL"
"Breathtaking panoramic 180-degree ocean views from this spectacular custom home on an elevated lot in the heart of Fire Mountain. Fully permitted attached in-law suite with access at ground level has full kitchen. Secluded half-acre lot has 40+trees, including four varieties of avocado and many other fruits. Open and bright floor plan boasts spacious kitchen-dining-living room on main floor anchored by stunning brick fireplace. Extra-large 3-car garage. Original owners. See Supplement for more info. Neighborhoods: Fire Mountain Equipment: Garage Door Opener, Water Filtration Other Fees: 0 Sewer: Sewer Connected Topography: GSL Guest House Est. SQFT: 800"